This is the Botswana flag. The background is mainly blue which represents water, which is precious in this dry country. The black and white stripes represent the black and white people in the country living in harmony. Roosters don’t just crow at the crack of dawn. They seem to crow whenever they feel like it, which might be in the middle of the night. I have learned to sleep through it. Ever since I have had to start washing my clothes by hand, I no longer toss my clothes in the dirty clothes hamper after one wearing. My concept of what is dirty has changed drastically. Botswana is the name of the country. Motswana is one person from Botswana, the plural is Batswana. Batswana usually avoid conflict. If you ask for something and they say Yes, it might mean Yes or could mean Maybe. If they say Maybe it probably means No. You would not want to be a dog or cat in Botswana. They are mistreated. Consequently they shy away from anyone who approaches them. We learned about how Botswana handle death and funerals the other day. One really odd fact… if a baby age six months or less dies, they sometimes dig through the floor of the house and bury the baby’s body underneath the house. A fellow trainee saw a large baboon the other day walking down the street holding an umbrella. White people are called “Lekgoa” in Setswana. It is not derogatory; it is just the word you might hear children calling as you walk by. I am told the literal translation is “Vomit from the seas”, which probably refers to the way the original white men came to the African continent, and probably was meant to be derogatory a few hundred years ago. 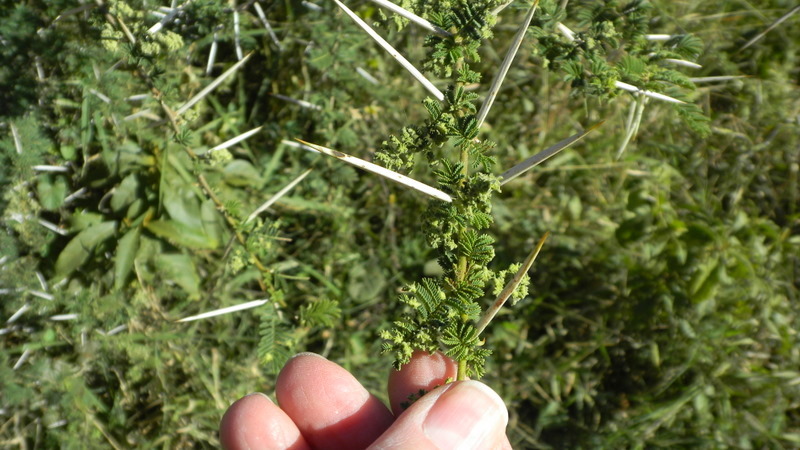 The flora in Africa includes a lot of thorn bushes of various types. One extremely common type is the Acacia. I am not sure if it is a bush or a tree, or a bush that grows into a tree. 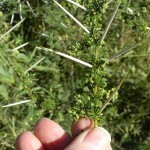 It has wicked thorns several inches long. At least the white thorns are visible from some distance. There are some trees that have equally long thorns that are brown and not visible until you have gotten your umbrella, clothes or body parts snagged. Winters are cold in Botswana. It got down to below freezing one morning in Kanye recently. The houses are neither heated nor insulated, so it was below freezing in our bedroom. Summers are hot. We have not experienced one yet, but are told the temperature get up over 100 degrees on a regular basis. The reason homes here have walls around them is to keep the roaming donkeys, cows and goats from coming on the property, eating the garden and pooping everywhere. Once a goat came up on our porch and looked in the door.